“Let me tell you the very best advice I can give you about presenting your portfolios!… ” You could have heard a pin drop. “Tell your story; describe your journey; explain your mission, but invite the visitors and judges to join you in your travels. The fascination for the ocean comes from its ever-changing moods. From danger to delight. From lapping to luscious. The challenge for an artist is well beyond the normal "motion" that's needed in a painting. In this watery world there are many emotions of the ever-moving seas. The seascapes, like other paintings, need motion with a purpose. A distinctive feeling that underlies the scene. Do the waves crash into each other? 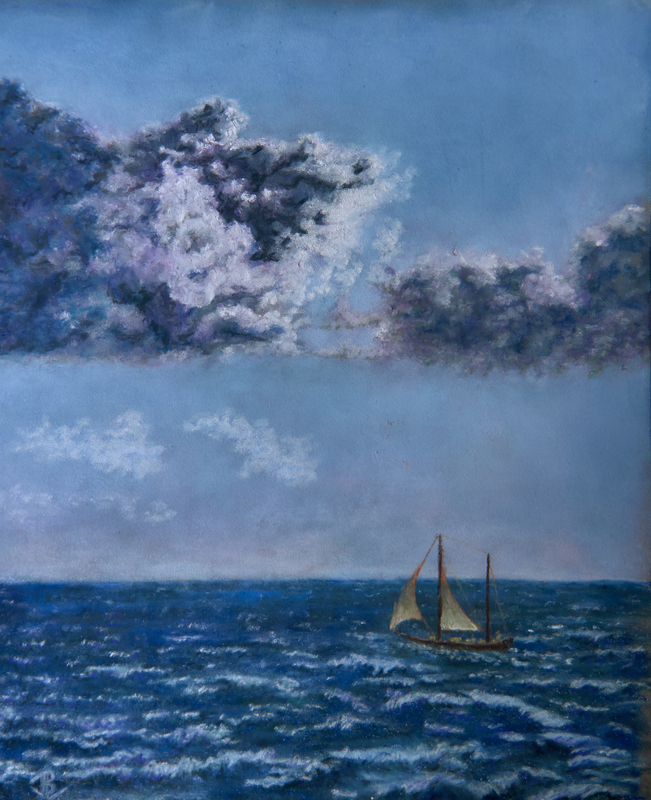 Does the glowering storm move to the sailboat faster than its homeward course? Do the rocks around the bay carry you , clambering, on a sunny outing around the crystal bay? 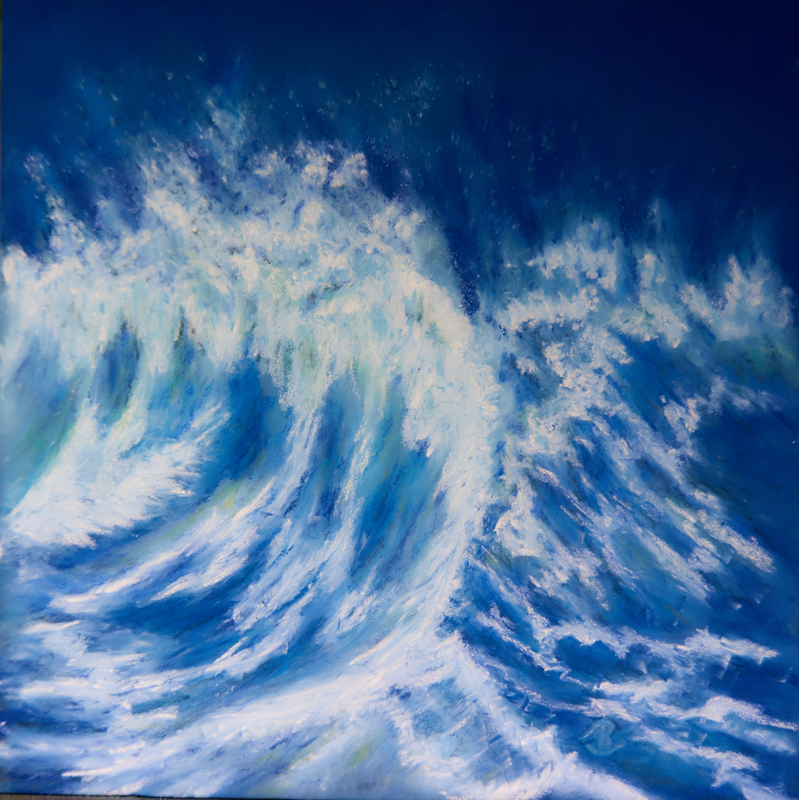 17½ x 17½ inches, framed Waves, Cresting, Roaring sea, Colliding, Foaming, Spray, Sea, Crests, pastel, painting, realistic, JBL-Art, Barrie Leigh Shooting for the moon? Or angry at becoming grounded onto the shore? The waves crash together with almost geologic violence.With the moon overhead and the sun lined up to oppose it, tidal waves are pulled to their highest peaks then sucked down to their lowest troughs. Spouts of foam shoot high above the spring-time sea. [Painted in PanPastels, high-pigment powdered paints, and overlaid with traditional soft pastels and pastel pencils. 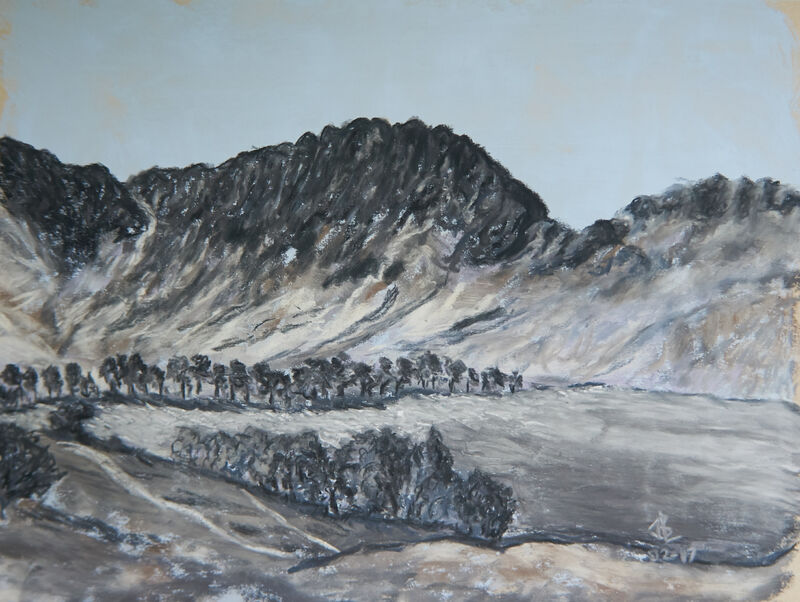 Mountains and mountain ranges create a panorama that is both dramatic and subtly changing from top to bottom and side to side. As we see these scenes through younger eyes, or remember the eyes of our childhood, it's the impressions and memories we recall. 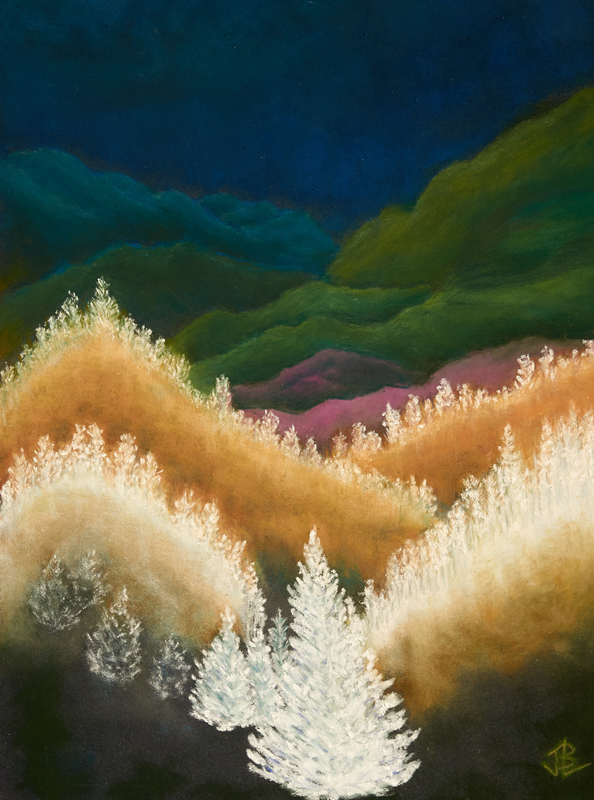 My mountain scenes depict colored and scaled expressions of our world. How would the smokies smoke at night-time? When is the early morning sun surrounded by the dark? Over time, my landscapes have evolved to regain the freshness I saw earlier in life. I start my landscapes using a greyscale reference image. I study the real scene, and reset my view, painting from a black and white version. 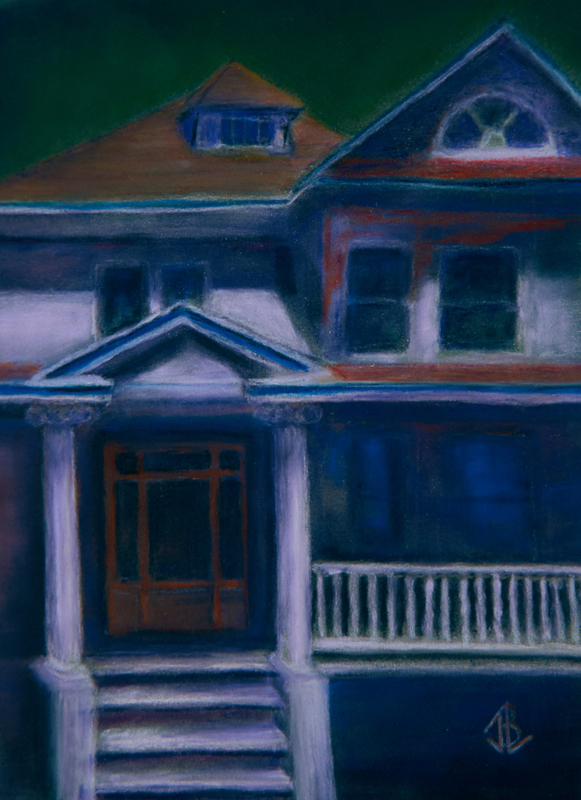 Each underpainting’s colors come from the message and the feel of the scene. With later layers of paint and other forms of pastel, I re-introduce the local colors by introducing the original scene’s colorations. 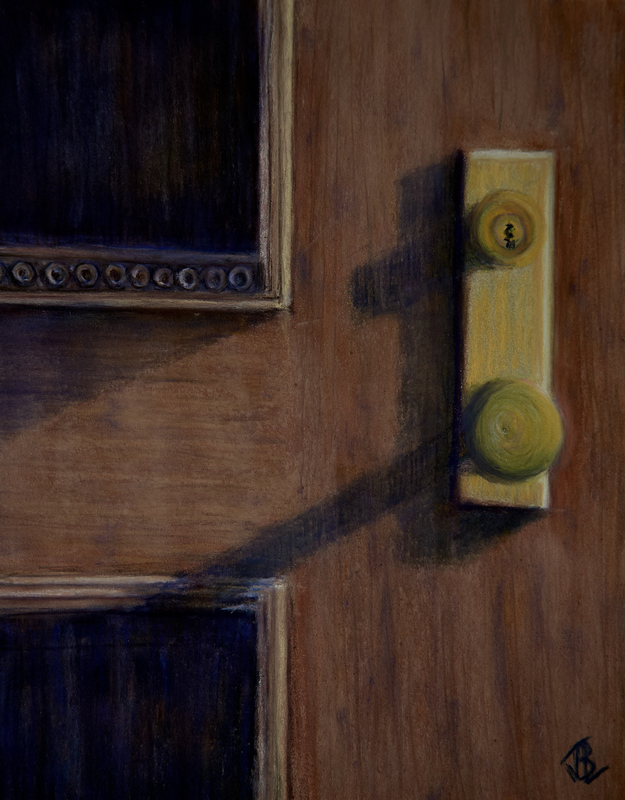 15½ x 18½ inches, framed We all decorate our home’s front door to make the right impression for our house. Look at Alaska’s front door, from the water. Not a bad way to enter a sub-continent. It’s exciting that it’s just one part of our United States. This scene, from June, 2015, looks across Resurrection Bay to the mountain tips in Kenai Gateway County above Spring Creek, Alaska. 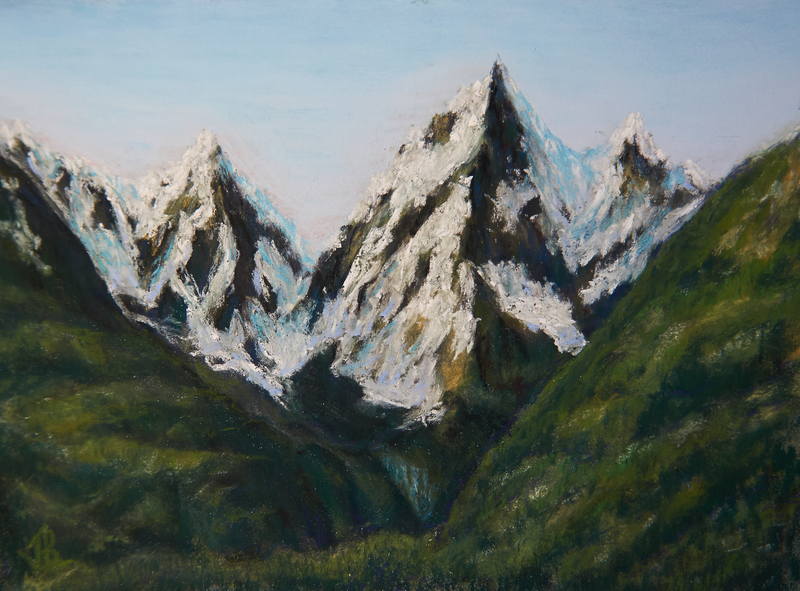 [The 3D effects on the mountains were created by building up thick layers of soft pastels with an impasto technique. 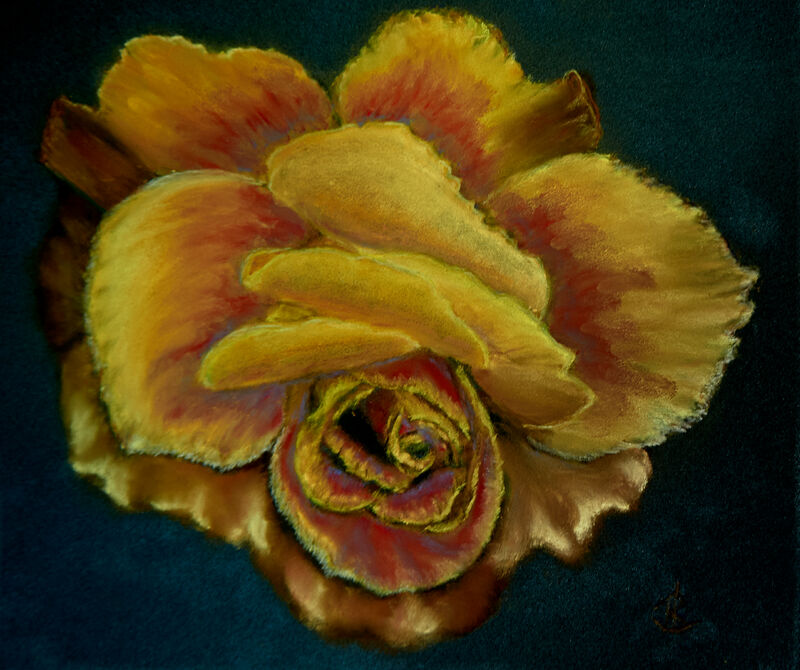 Artist quality Sennelier, Rembrandt and Mungyo soft pastels on acid-free 200 lb. In this portfolio, most paintings were created by painting three often complete layers one on top of another. Few of these pieces were painted simply with one type of pastel, such as “just” PanPastels. 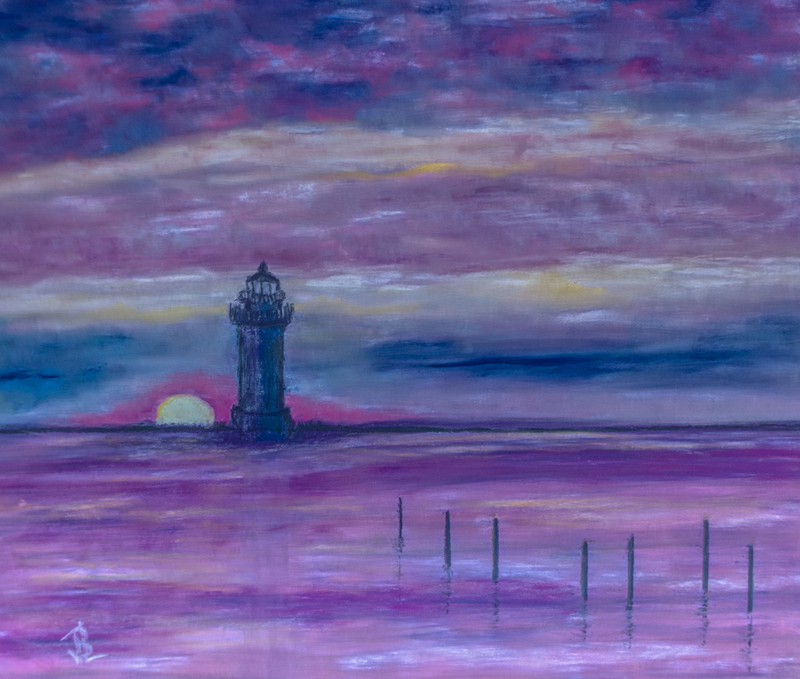 As I experimented with different forms of pastel paints, I realized that the greatest strength of pastels comes when you blend together their different forms. 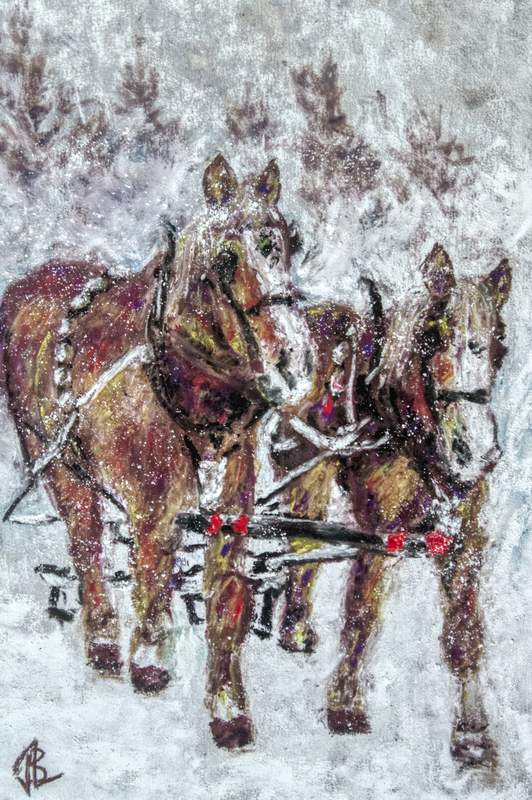 Compared to other mediums of paint, pastels provide many distinct forms you can use: powder, paint stick, pencil. Each can carry and convey different effects for your scene. As the birds around us become bigger and more brightly feathered, their plumage seems to take on a rippling life of its own. The structure of the feathers and the deep shadows between so many of the layers is a challenge for any painting medium. 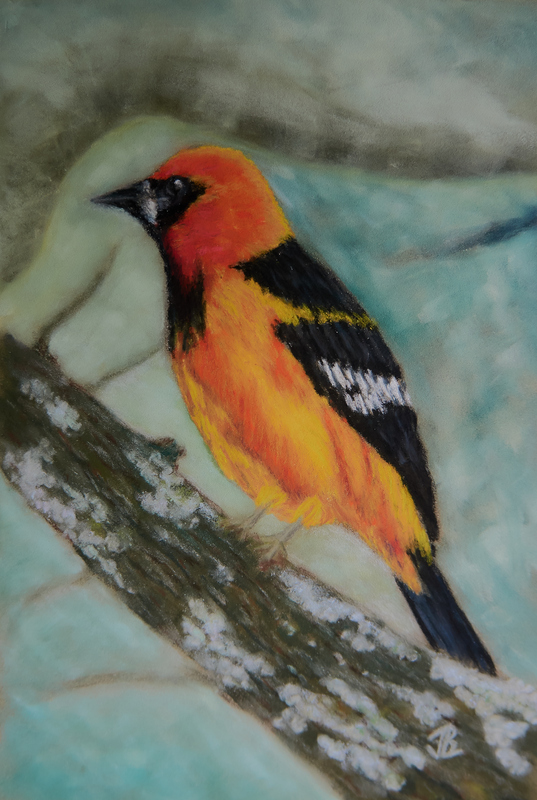 To capture the delicacy of the plumage, I begin with a full painting using PanPastels to color and shape the main elements. 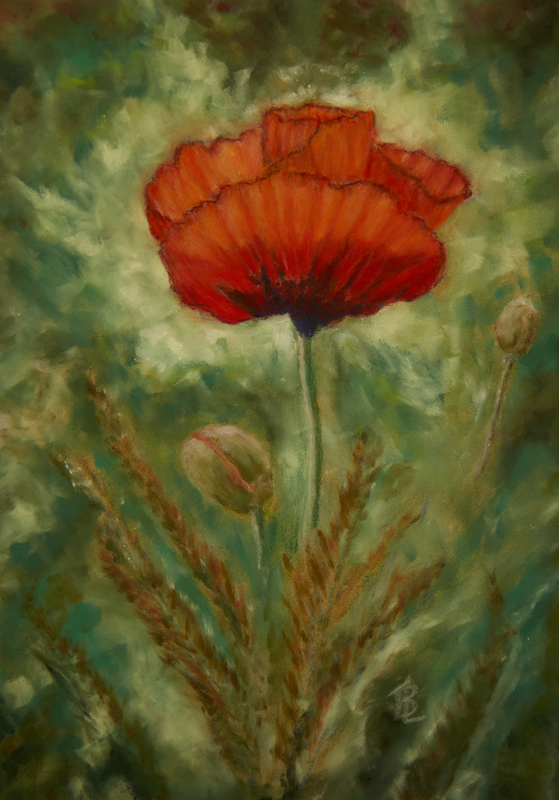 I use soft traditional pastel sticks to apply an overcoat of deep pigment that follows the direction of the feathering. 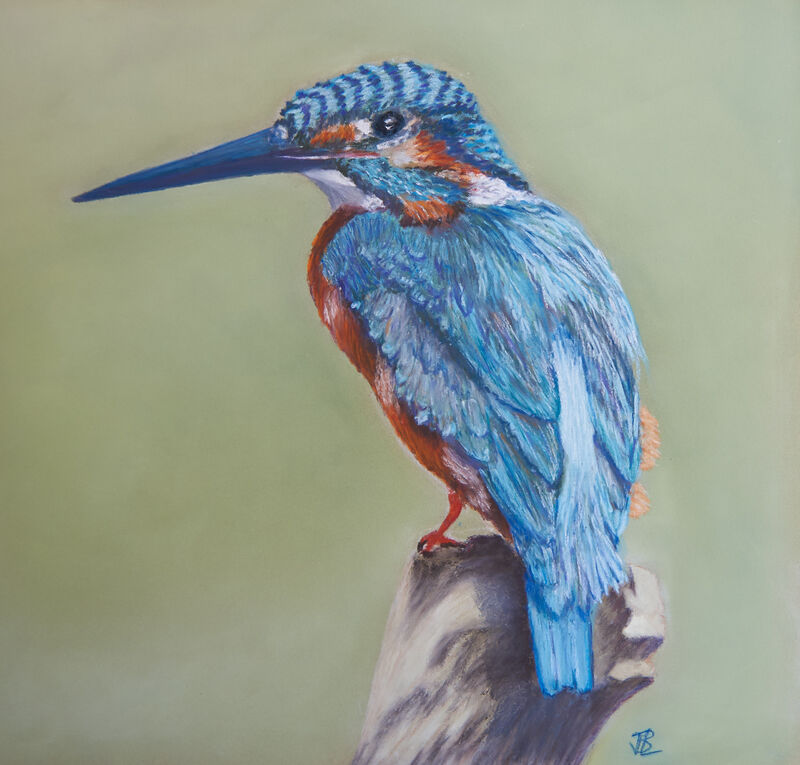 The final shaping of the feathers involves pastel pencils to establish the edges of key groups of feathers, and to blur and darken the shadowed areas. 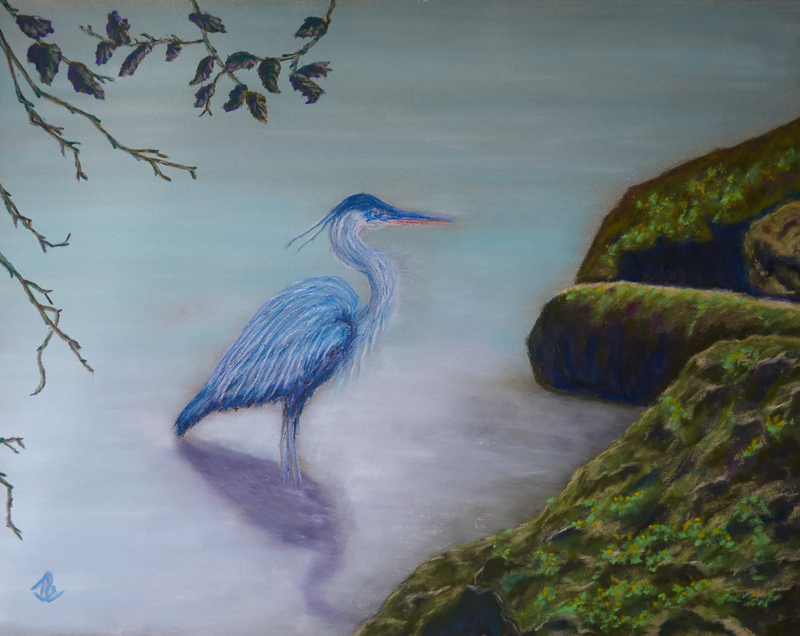 19½ x 23½ inches, framed Through a small rocky inlet sheltered from the river in Susquehanna State Park, the Great Blue heron wades the shallows, casting a hazy shadow that fades along with the daylight. The day’s end draws out the subtle coloration of the rocks and their spreading lichen. In the muddy nearby water, it’s rocky reflections we see rather than the deep shadows created earlier that day. [The smooth waters were painted with PanPastels. 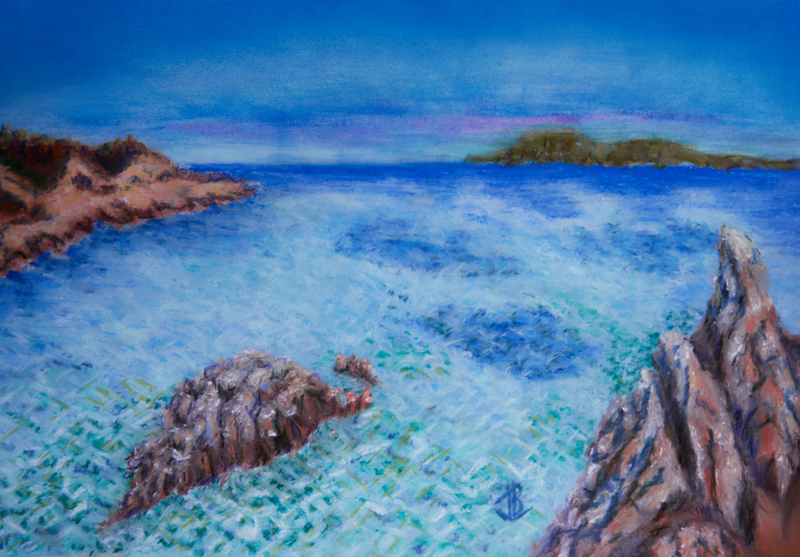 Soft pastels added depth to the tops of the rocks, and shaped the lichen. 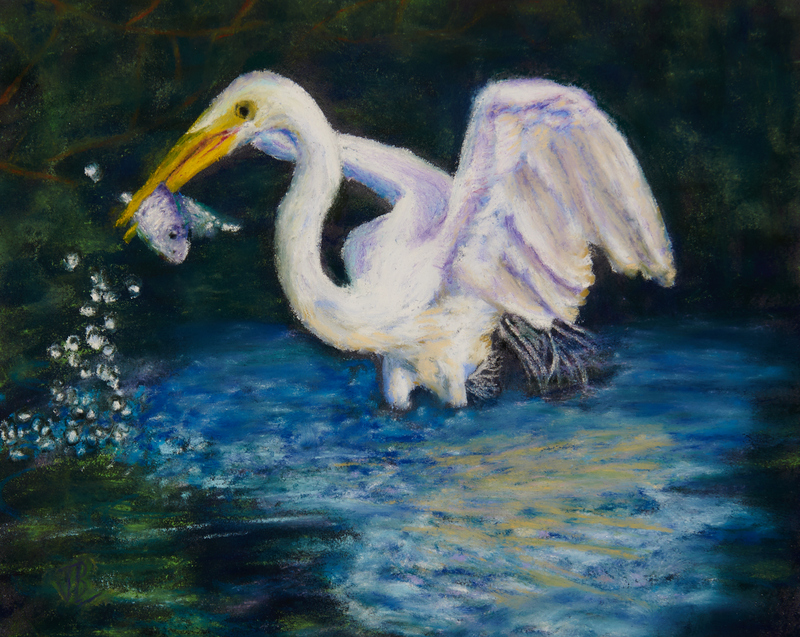 19½ x 23½ inches, framed Water surges before the gentle swimming swan in its search for food. The direction of lighting is very unusual, as most swans are painted facing the light. In this painting, the swan is almost running from the light. 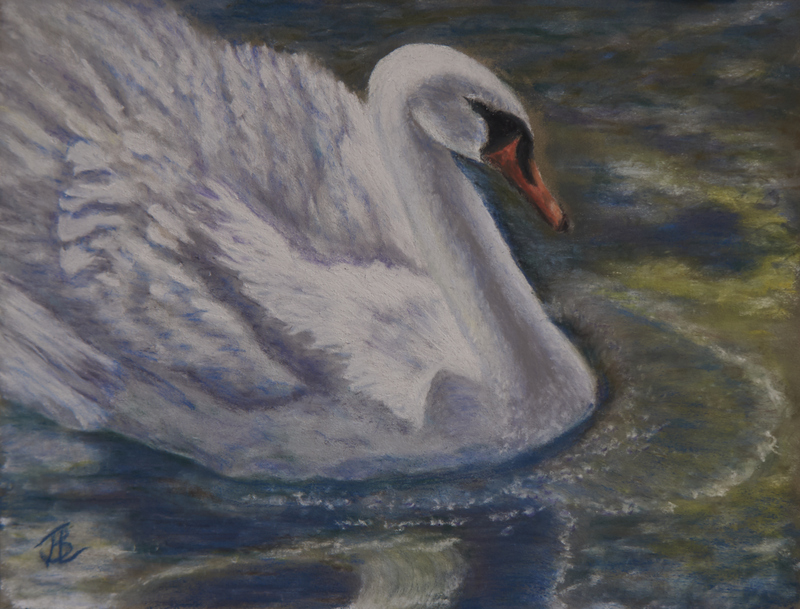 Another challenge in the painting is the water ripple in front of the swan’s breast. Notice how the heavy bird actually pushes the water downwards, and the ripple tucks underneath the swan. [Underpainted in PanPastels. Traditional pastels reinforce textures. 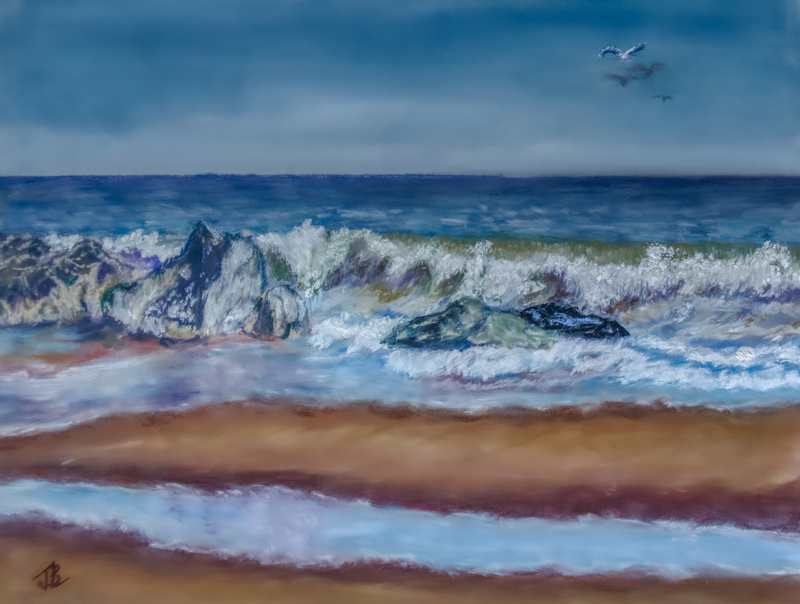 Sharp edges and blurring added using pastel pencils. 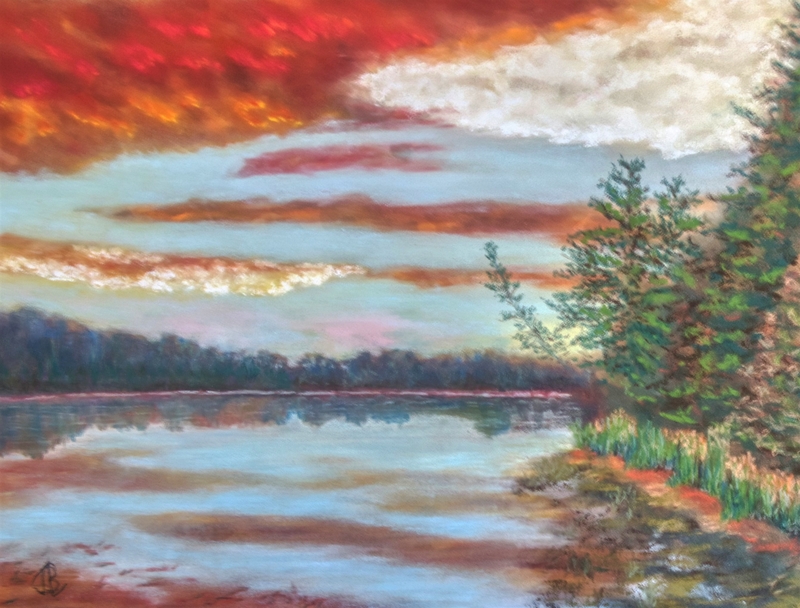 Soft pastels on acid-free 200 lb. This project is alcohol induced―denatured alcohol, not the kind for drinking. Similarly to the carefully planned multi-layering of watercolors, these pastels were underpainted and overpainted in multiple layers, by setting each layer with alcohol. 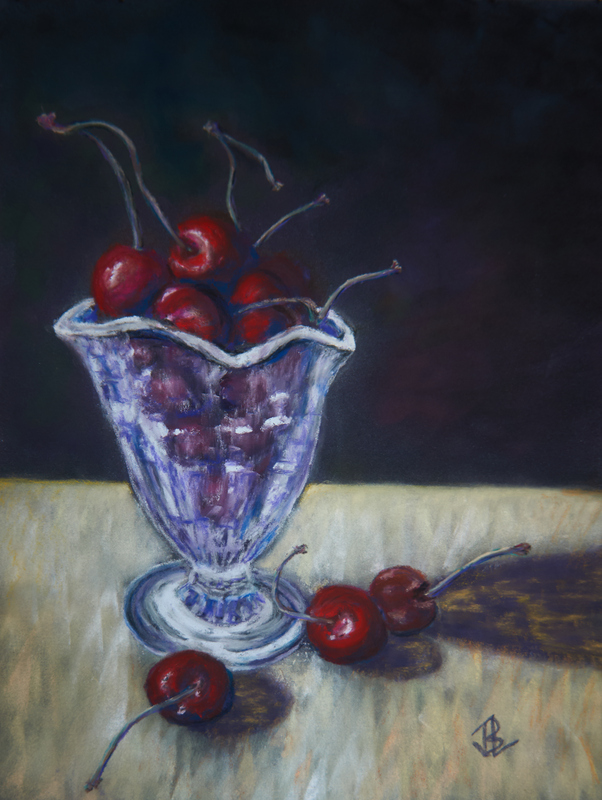 The soft pastels I apply on top do not blend with the background. This produces an impasto effect of sharp outlines and stark separation of still life elements from their surroundings. 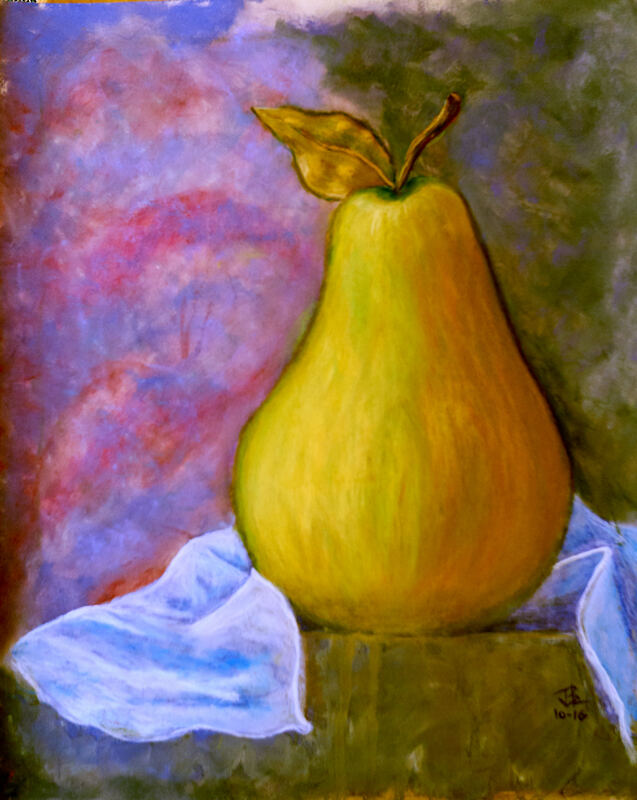 Still lifes provide a canvas to expand our use of high-energy colors, and create eye-catching interest. I bring impressionism into the modern day with: splashes of color to drag your attention, planned pathways of light to curve the direction of your attention through other elements of the scene, and sometimes, pools of deep shade to provide mysteries to unravel. In a lovely painting of a single bloom with its touchable soft-edged curving petals―where did those gracious shapes come from? How do they rise off the painting towards you? In my case, these flowers rise from their ashes. The feeling you get from looking at a flower often comes from the color of the flower’s shade, as much as from the natural local color of the flower itself. It’s like starting at the back of a flower, and then working towards the light. I paint flowers by first creating a painting of only shadows. This painting uses the shadow colors. The color left over to shine through a petal after the local color you see has been reflected out of it. The shadowy areas blend and bleed through each petal to shape them. Darker shadows separating deeper layers of petals. What you may notice first, is often added only last. Crusting each petal, the brightest and lightest highlights are added at the end, and blended to show the curving and rippling petal. 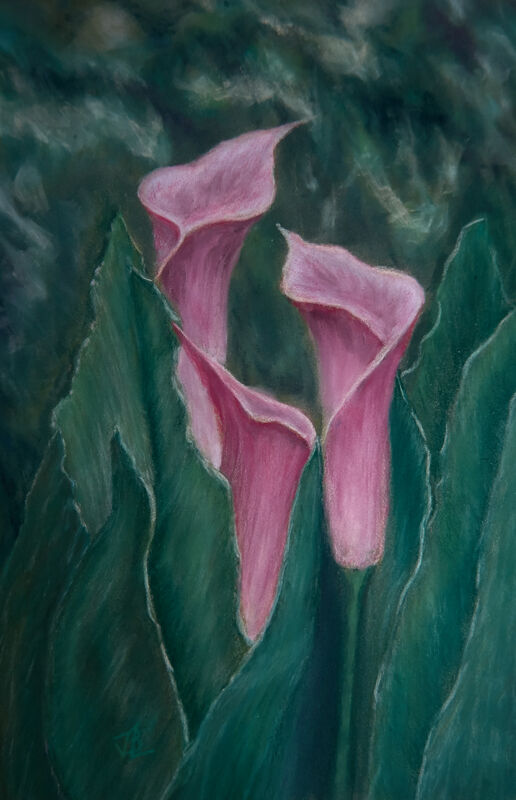 Pastel pencils add the clear curving edges of the petals. My flowers are painted backwards, from back to front―and ending on the brightest tones. And what was a “breach” anyway? In fact, it was a hole in your wall. A risky thing to leave uncovered in the days of kings and castles. But, do you have any breaches around your home? enliven your day, cheer up your room, make you reminisce, give you pause for thought...or a thousand reasons more. Did you discover some pieces on your journey through this portfolio that you’d like to see more often? In fact, you could see them whenever you wanted to. We can arrange for that. 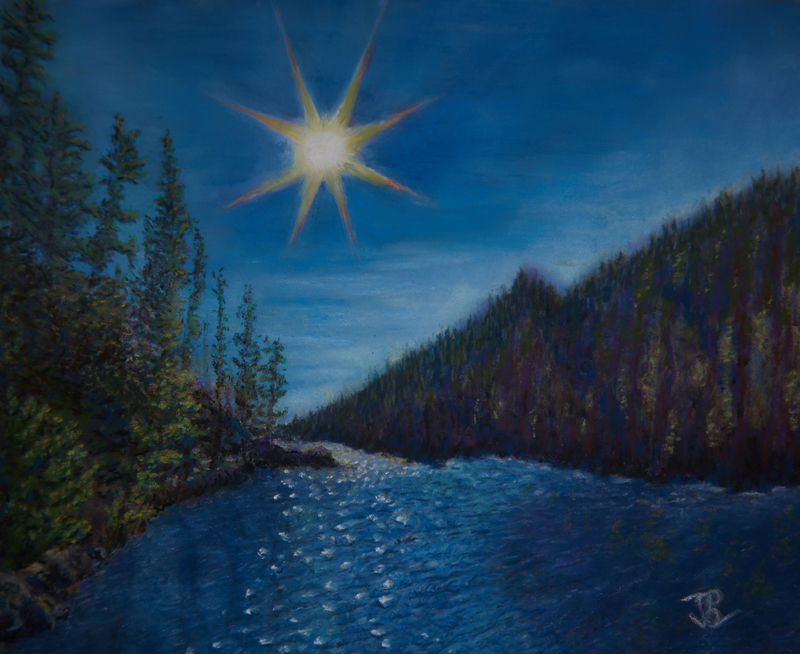 You’ll also find my full portfolio has even more paintings than those you saw here. Friends tell me my paintings are much more impressive in person than these photos over the internet, and they may be right. The best thing to do is to contact me. where a number of my paintings hang.